Below are some of our favourite day use areas and picnic sites in Banff and Kananaskis Country near Calgary. Located on the Lake Minnewanka Loop Road near the Town of Banff. There is a sandy beach for swimming (though the water is very cold,) and this is a popular place for kayaking, canoeing, or stand up paddleboarding. There are no rentals on site so plan ahead if you want to paddle. There are a few picnic tables on site and two pit toilets. There is a walking path around the lake and if you look carefully, you can search for the two hidden swings along the path, one that you can use to swing into the lake. The rope swing for jumping into the lake is accessed by crossing the bridge near the beach and then following the path around the lake in a counter clockwise direction. It's a 5 to 10 minute walk down the path. Located on the Lake Minnewanka Loop Road near the Town of Banff. This is a popular picnic area with many picnic tables, fire pits, and a walking path around the pond. Bathrooms are also on site. It is also one of the main parking areas for the popular Legacy Trail, a paved bike trail which connects the mountain towns of Banff and Canmore. Finally, the bridge at the far end of the pond is fun for jumping off of. It is recommended that you check the water depth first before jumping, and tall adults may find the water to be too shallow. For directions to the pond, consult Google maps where you'll see the pond right as you turn off the TransCanada Highway for Lake Minnewanka. 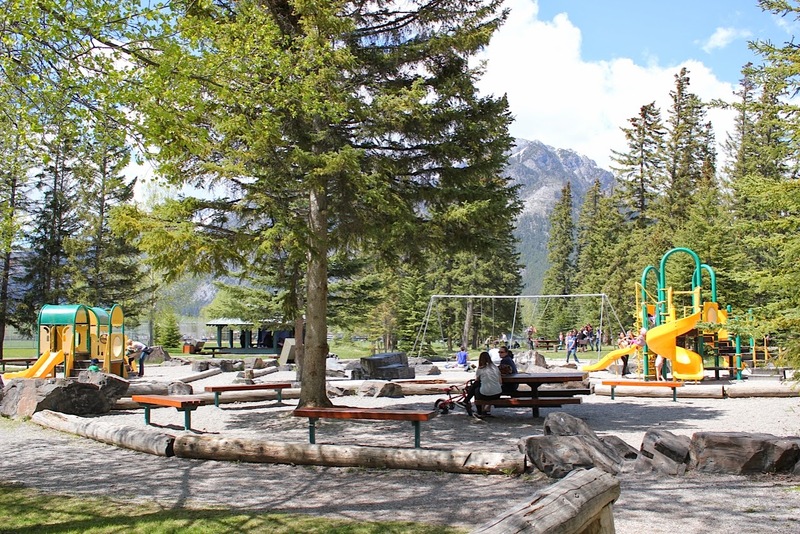 This picnic area is located 4 km along a paved hiking or biking trail from the Cave and Basin National Historic Site in the Town of Banff. The trail gains 145 metres of height but is stroller friendly. The Sundance trail is 4.4 km in distance one way and leads you to the entrance for the Sundance Canyon, a short loop hike through an interesting canyon filled with waterfalls and bridges. At the entrance to the canyon there are picnic tables and there's even an outhouse bathroom. This picnic area is located on Sundance Road across the river in the town site of Banff. You’ll find a large parking area, the biggest playground in Banff, and a small bike park. There's also a brand new skatepark here that we think is the best one we've seen in Alberta. There are also stoves for barbecuing here (bring your own wood) and picnic tables, making this a great location for a picnic with friends or family. For other picnic ideas in Banff, please read this story that I wrote for Banff Lake Louise Tourism: Perfecting the Classic Mountain Picnic in Banff National Park. The Ribbon Creek Day Use Area is located below Kananaskis Village off of Highway 40, and is a great destination for a day trip to the mountains. From this area, you can access the paved Bill Milne Bike Trail and connect to the Mt. Kidd RV Park or Wedge Pond to the south. Read more about family biking in Kananaskis here: The Best Family Bike Trails in Kananaskis. You can also hike or bike to Troll Falls from here in a short round trip distance of less than 5 km. The hike is on wide ski trails, is relatively flat, and is very manageable while pushing young children in a chariot type stroller. Finally, enjoy hiking the Ribbon Creek Trail. This is an easy, relatively flat trail, that crosses many fun bridges for the kids. Hike it as an out-and-back, and go as far as you want. The The Pomeroy Kananaskis Mountain Lodge and Kananaskis Village is a great place to spend a day with the family in the mountains. Here you'll find a playground, coffee shop, ice-cream, a family-friendly restaurant with a great patio, a pond area for the kids to play at, and a paved walking trail called the Terrace Rim Trail that is lined with wild flowers and benches for enjoying views across the valley. Return in the winter to skate on the pond, enjoy cross country skiing or snowshoeing on the village trails, or to go downhill skiing at nearby Nakiska Mountain Resort. Located just a few minutes further south along Highway 40, you'll find a lovely picnic site here on a pond that's great for a quick dip on a hot day. There are lots of picnic tables up above the pond and there's also a walking loop around the pond. This pond is also accessible from Kananaskis Village via the Bill Milne paved bike trail should you wish to connect the two. There is one picnic table that I saw but beyond that, there are no fire pits. This is mostly a great quiet spot to visit so that the kids can play in the creek. And if you want to take a bigger hike while here, check out the story I wrote about hiking King Creek Ridge: King Creek Ridge - Family Hiking in Kananaskis. Read about our recent hike to Rawson Lake and Sarrail Ridge here: Rawson Lake and Sarrail Ridge, Family Hiking in Kananaskis. You can also follow the Upper Lake Circuit towards the Point Backcountry Campground (hike out and back as far as you want to go following the scenic lakeshore trail) or hike the Mount Everest Expedition Interpretive Trail from the nearby White Spruce Day Use Area. We've just discovered the Peninsula Day Use Area on the Lower Lake in Peter Lougheed Provincial Park. It's a great spot if you're camping in the area, or as a day trip from Calgary. There are picnic tables down near the water (no fire pits) and it's a great place to launch boats. Families will love the small little inlets where you can let the kids paddle sit on top kayaks in a small protected area. This is one of the few picnic areas in Kananaskis with fire pits and picnic tables, and it is a premier spot for a picnic or wiener roast. Bring your own wood if you want to have a fire. Children will also enjoy playing in the Elbow River below the suspension bridge. You'll even find some small sandy areas to play in. Note that Highway 66 is closed past Elbow Falls from December 1st to May 14th each year. Read more about the Nihahi Ridge Hike here: First Summits - Nihahi Ridge, Kananaskis. The Elbow Falls Day Use Area is located in the Elbow Falls Provincial Recreation Area. The highway closes here from December 1st - May 14th each year, but you can access this day use area year round. You'll find picnic tables, outhouse bathrooms, short little trails, and a beautiful waterfall. Children will have fun playing on the rocks and in the river. The Beaver Lodge Day Use Area is a simple area with walk-in picnic tables and a great little hiking trail along a creek with beaver ponds. This day use area sees less traffic than most and lots of fun can be had along the creek. We like to bike here from Elbow Falls before the highway opens on May 15th each spring. It's a very short bike ride on a closed highway to the Beaver Flats Campground where you'll find the Beaver Flats Interpretive Trail along the creek. To read more about spring biking and hiking in this area, read: The Best Spring Bike Rides in Kananaskis. Quarry Lake is Canmore's local town beach and one of the best swimming lakes in the Canmore/Banff area. To find the lake, consult Google Maps where you'll find the lake on the way to the Canmore Nordic Centre just outside the Town of Canmore. There are no fire pits and few tables so bring a blanket for an old fashioned picnic and don't forget the sand toys for the kids. There are several day use areas around the Bow Valley Campground and in the surrounding provincial park. The Whitefish day use area is a scenic spot beside the river with fire pits on site. Children will enjoy throwing rocks in the river or hiking along the riverside trail here. The Many Springs Hiking Trail is also in this area with its own separate parking area. And finally, the Middle Lake Day Use Area has its own short hiking trail around the lake. We try to time an annual visit here for late April before the Bow Valley Campground opens for the season. This way we can bike all of the closed campground roads, ride over to the Many Springs Trail, and have a picnic beside the river. The Sheep Falls Day Use Area is located in Sheep River Provincial Park. There are picnic tables, fire pits, and outhouse bathrooms on site. The waterfall is a short walk from the day use area and is much bigger than Elbow Falls. This is a great option for families in South Calgary wanting to take a day trip to the mountains. Note that this highway is closed during the winter from December 1st through May 14th. The Sibbald Lake Day Use Area is located in Sibbald Lake Provincial Recreation Area just west of Calgary. This is the access point for the Deer Ridge Hiking Trail. Families will also find fire pits and picnic tables beside the small lake. For directions and more information, please visit the official Kananaskis Website here. There is information on day use areas as well as all hiking trails in the park. For Banff, visit the Parks Canada website here. Great list, Tanya. We might just use one of those suggestions this weekend! Great Christine, glad to hear. Wow, the pictures have me drooling over these sites. Wish they were closer to home for me. Wow! What a great list! How on earth will I decide where to go first! We're heading to the mountains for the day on Sunday (my perfect Mother's Day) and wondering if you could pick your favourite 3?? Thanks for putting this together! Tanya, we did the Troll Falls hike in the morning yesterday and then walked around the river in Canmore in the afternoon. It was a perfect day! Thanks for the suggestions. Everyone had a great time. Glad you had a fun day and that you liked Troll Falls. We're heading to Canmore today to bike along the river. Thanks Derek. I will update the post. I haven't been down there since the flood myself. Mount Lorette Day Use area has fire pits, and a series of ponds with paved pathways. Good for a picnic and easy stroll for preschoolers, or elderly in wheelchairs. We stop there to use the bathroom, before hiking along Sandy trail/Troll Falls. Thank you for this list. We enjoy weiner roasts with grandchildren, and often struggle to find fire pits.